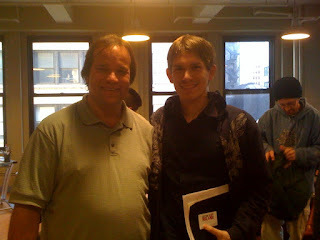 Came back from a wonderful weekend attending two classes of Bang! Zoom! 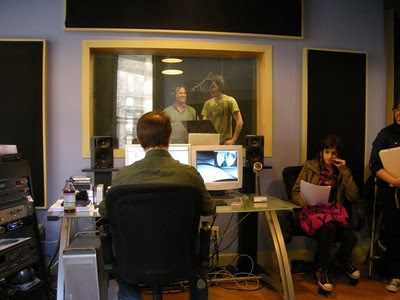 Studio's Adventures in Voice Acting over at Edge Studios in NYC. Me and some very talented new friends of mine got to do professional practice anime dubs and hang out with a legend in the anime business, Tony Oliver. There was much more than just dubbing anime with the legit system used in the industry. We got to learn the basics on how to create a character (acting 101), the process of anime voice dubbing, video game dubbing and pre-lay (non-anime animation) and the science behind it all. Yes, there is really a science and technique to it all, from the correct breathing, to the various placement of your voice, the acting, the "music" of your voice and making sure you don't hurt yourself by putting the voice all in your throat. The human voice is a very advance and diverse instrument and these classes helped me find some of what I'm good at and what I need to improve on. It's been about 8 years since my days in select chorus and voice clases so I definitely had a recap. tony was a very, very good teacher. He never made anyone feel bad when he told of the corrections they needed to do and everyone there got better at the end of the day. Both days we had some fun and funny dubs that were mixed right in their with the legit music and original voice actors, particularly one with the hot dog scene from the Sakura Wars game. I found that I didn't do so well as Kyon from Haruhi, mainly because I tried to deepen my voice. I found my normal voice sounds similar to Crispin Freedman's version and I should have went with that. I did very well though as Yukiatsu from Ghost Slayers Ayashi once I began to fine tune my acting and voice. The next day I did the role of Simon from the end of Gurren Lagann (a big spoiler for me since I only saw up to ep.7 from the series) and it was cool to have Tony directing me on that one since HE was the one who did Simon's voice on that scene. So, am I on track to be an anime voice actor? Yes, I am. The benefit of a studio doing a class like this was that some of our bits were downloaded into Bang! Zoom! 's talent pool and any one of us could be asked for an audition from there. Actually one of the previous classes ended up doing the legit dub to Magical Girl Lyrical Nanoha, so just from there, there's a chance you could hear any one of us in an upcoming anime. But....it's not just that simple. I do have to practice various voices to put on a demo and to do it right, the demo has to be from a studio. From there I send the demo out to FUNimation and others and hope for an audition. If I pass an audition, which many professional voice actors only make it through about 15% of, then I'll have a role in an anime. This is the reality of the business plus anime doesn't pay as good as say a TV commercial but hey...I'd gladly do a voice in say the dub of Sora No Otoshimo (when it eventually comes) at the current pay rates and it still pays more than the part time day job that keeps me from being a full time anime store owner -_- I'll most likely be making a trip to Burbank CA to get that demo done though. Be sure to check out Bang! Zoom! Studios main site. Also, if you want to be in voice acting, particularly in video games, DO attend these classes; you find out exactly how it's done (the three BEEPS are still in my head ^^) and you will know from these classes if you really want to do it or not.